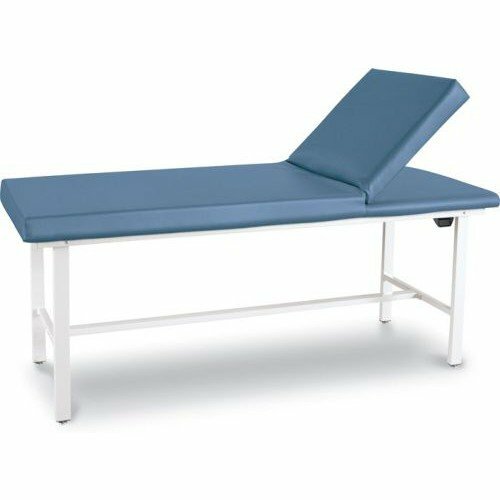 The Treatment Table with Adjustable Backrest, by Winco Manufacturing, has all of the attributes shared by its relative the Treatment Table, but has a major feature added with its adjustable backrest. This version gives the exam table a point of articulation that raises the patient's upper body and head when needed. This allows a doctor, nurse, or physical therapist more angles to diagnose and adjust the patient as needed. Along with the numerous other features, the Treatment Table is made of durable materials that look and feel great and stay that way for years. 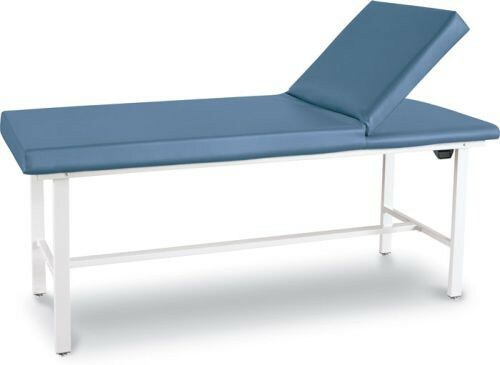 The Treatment Table with backrest has several features and qualities that enhances overall patient care, one of them being the soft comfort for padding. The two inch thick pad is made of medium density foam and has a thick vinyl cover for protection and aesthetic appeal. The vinyl cover is offered in a number of color choices. See the adjusting table color selection sheet and send to Vitality Medical upon ordering. The backrest is fully adjustable equipped with a gas spring to maintain a sturdy hold and enhance patient comfort. The angle range covers 6 to 57 degrees of angled articulation. The table's two pairs of legs are reinforced by cross beams. It has a center beam to support each of the leg pairs. For the SH model, there is instead a metal platform that connects to the leg pairs and rests over the cross beams for support and for storing items. For the C1 model, there is an open shelf and a two cabinets, while the D1 model has handled drawers instead of cabinets (see alternate photos) and an open shelf. The metal has a white powder coat paint. Allow a 48 hour turnaround time to fulfill the shipments as requested by the manufacturer. The table end elevates at multiple angles with a handle that raises and locks the headrest to the desired height. There are variety of options for storage with shelf, cabinet, and drawer options.